ST. MADELEINE SOPHIE’S CENTER offers a nonpublic school transition program for students 17 – 22 years old. The purpose is to provide additional program supports & training of students with developmental disabilities who remain eligible for services until age 22 and would benefit from an individualized academic and vocational training program. ST. MADELEINE SOPHIE’S CENTER’s nonpublic school program offers young adults with developmental disabilities who may also have other physical challenges a wide range of intensive, individualized interventions designed to provide needed assistance in areas of academic, social & vocational training that will allow a smooth transition to adulthood. The goal is to clearly identify strengths & weaknesses of the individual and, in the process, stimulate students’ awareness of their strengths in order to assist them in addressing their challenges. The program uses information from a variety of sources including the student’s social, emotional, psychoeducational, and neuropsychological context to implement the students’ IEP and designated instructional services. The program serves students who need a more-structured, non-traditional, and supportive school environment. The program meets the needs of young adult students in academics, work preparation and lifeskills, and community integration and growth. The center’s design and opportunity for related services accommodates students with developmental disabilities who would not benefit from a traditional public school academic program. Students attend school for at 1,680 minutes per week, which includes small group instruction, transition services, and counseling. These school-based services are available to each student during the regular school year and the extended year. Other supervised instruction available based on student needs are independent study, independent living skills and vocational education. Vocational counseling, mobility training, and job placement including job coaching and paid employment are available. Counseling consultation and support to parents are also provided. Adult students who need an independent living focus study applied and functional job readiness, functional academics, community-based instruction, and self-help skills to prepare for employment and maximum independence. During instruction students have the opportunity to develop valuable social and transitional skills and have access to computers and Assistive Technology. Adult students who need to focus on a high school diploma can earn credits to meet district high school requirements through on-site content area instruction and individualized, independent assignments in core academic areas to complete at home. Students work with psychologists and school counselors to deal with self-esteem, emotional and social issues. Counseling staff provide help with nutrition, life skills, job-related social skills, vocational awareness, goal setting and self-confidence. Work-Based Placement Support provides students the skills, resources and information they need to locate and maintain employment opportunities both in supported settings and independently. Transition planning is the process of students, school, families and communities working together to determine effective educational experiences to assist students with disabilities to achieve their goals and prepare for their adult roles. ST. MADELEINE SOPHIE’S CENTER works with students to provide work-based learning experiences and community linkages that support transition planning and progress. Positive behavior development is a focus in the school program and is supported by trained professionals. Positive reinforcement in the form of tangible rewards, verbal praise and encouragement, and building self-esteem are available for all students. Students are advised, supported and rewarded for establishing participation in routine physical fitness activities and community fitness resources. Language and Speech Therapy and Occupational Therapy are available to students with a documented need for these services. Assessment and evaluation occur prior to acceptance into the program. A review of records and an interview are necessary prior to admission. Students must demonstrate a willingness and potential ability to work toward individual and program goals in academics, social development, and independent living. For a copy of our brochure, click here. For more information, please contact Bill Blankartz or Katie Hall at 619-442-2033. Peg Fraenzl wth dear friend and Auxiliary member Fran Axelson, at the Auxiliary’s June, 2009 Installation Luncheon. Peg’s 90th birthday was also celebrated at that time. Margaret (Peggy) Fraenzl was just 94 years young when she left us on June 17, 2013 for a higher and heavenly purpose. She was born on May 15, 1919 and died peacefully with loving family members present. Long-time friends and family members gathered at Our Lady of Perpetual Help Parish in Lakeside, CA on June 25th for her beautiful funeral mass, preceded by the saying of The Rosary by Rev. Ron Buchmiller. Peg was beloved by so many, including her St. Madeleine Sophie’s Auxiliary ‘sisters’ who shared so many life experiences together. Many memories were brought to mind among Auxiliary members who joyfully shared stories during the special luncheon hosted by the Fraenzl family. Peggy was a role-model to many in the community, wearing many hats over the years… from loving wife and devoted mother to active volunteer and philanthropist. She is respected and recognized for her influential role in the history of both the St. Madeleine Sophie’s Auxiliary and St. Madeleine Sophie’s Center. The mention of Peg’s name immediately prompts her role as the Auxiliary’s First President among many other aspects of service. She also played a direct role in the 1966 start-up of the Center, interacting as a parent with the Religious of the Society of the Sacred Heart in El Cajon, and specifically, Sr. Mary Mardel, RSCJ as Executive Director. Peg’s daughter, Margaret (Meg) Fraenzl was then – and remains — among the original students at St. Madeleine’s. The following is among Peg’s fond memories of the St. Madeleine’s beginnings in 1966. It is an exact excerpt from an interview done by Auxiliary member and long-time friend of Peg’s, Fran Axelson. “At that time, there were 8 students accepted for the school. I went to the Sister and asked for an Auxiliary…and she agreed. Then, my sister-in-law, Miriam Reed and I drew up a set of suggested by-laws and presented them to the members. The members, in turn, made changes to the by-laws and voted on the changes. We contacted other people to join the Auxiliary at that time. Dr. Betty Zak Lauerman (2nd Vice-President of the Auxiliary) was very active in all the activities. 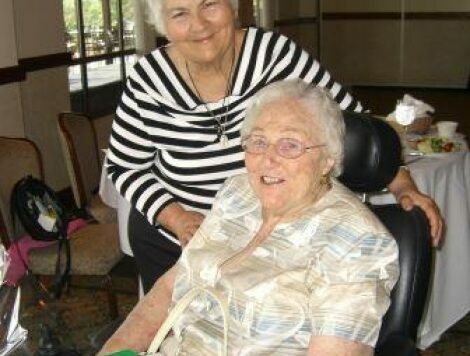 Peg Fraenzl is survived by her daughters, Margaret (Meg) Fraenzl, Lakeside, CA; Anne Keonig, Santa Ynez, CA; and Kay Noble, Happy Valley, OR and sons, Gerry and wife, Terry Fraenzl, Alpine, CA and John and wife, Debbie, Woodland, WA. Peg’s loving husband, Lester is deceased as well as their daughter, Claire Fraenzl and son, Owen Fraenzl. On behalf of everyone in the SMS Auxiliary, Rest in Peace, Peg. You will be greatly missed and always remembered with the greatest of love.